Häufig erfordern Untersuchungen von mechanischen Systemen die Durchführung einer Reihe von rechnerischen Experimenten zum Beispiel zur Analyse des Systemverhaltens in verschiedenen Arbeitszuständen, der Sensibilitätsanalyse von Parametern oder zur Auswahl von optimalen Parameterwerten. Das UM Experiments Modul enthält eine Reihe von Tools (scannen, optimierung, approximation) für die Durchführung erweiterter dynamischer Analysen von mechanischen Systemen. Diese Tools führen automatisch eine Reihe von numerischen Experimenten durch, protokollieren den Verlauf der Berechnungen und speichern die Ergebnisse auf der Festplatte für eine spätere Analyse und ersparen dem Anwender so die wiederholte Ausführung von numerischen Experimenten "per Hand", zusätzlich zur Arbeitszeitersparnis lässt sich so auch die Zuverlässigkeit der Ergebnisse durch die Vermeidung von Eingabefehlern erhöhen.Zur Durchführung numerischer Experimente zum Scannen und zur Approximation des Models des mechanischen Systems macht der Anwender Vorgaben zu Parametern, ihrer Grenzvariationen, ihrer Genauigkeit und der Zielfunktion der Optimierung.Nach dem Start des Programms und der Eingabe der Vorgaben laufen die Berechnungen automatisch ab. Echtzeitprotokolle zur durchgeführten Anzahl der Experimente und einer Prognose der Restlaufzeit der Berechnungen sind während der Laufzeit verfügbar.Die Ergebnisse abgeschlossener Experimente laufender Berechnungen werden automatisch auf der Festplatte gespeichert. Im Falle eines Stromausfalls sind die Daten der abgeschlossen Experimente bis zur Stromunterbrechung voll verfügbar.Die Ergebnisse der rechnerischen Experimente können graphisch in Form eines Oszillogramms, Übersichtsgrafiken und 3D Oberflächen unter Beibehaltung aller gespeicherten Charakteristika dargestellt werden. Alle verfügbaren Tools des UM Experiments Moduls sind in der Anzahl der untersuchenden Parameter nicht beschränkt, alle Analysen lassen sich mehrparametrisch durchführen. Daher wird die Parameteranzahl einerseits durch die Art der Aufgabenstellung und andererseits durch die zur Verfügung stehende Maschinenrechenzeit begrenzt. Obwohl jedes Tool seine eigenen Vor- und Nachteile hat, lässt sich durch die Kombination dieser ein weites Spektrum von Aufgaben der Analyse und der Optimierung des Verhaltens von mechanischen Systemen abdecken. In der Demo-Version ist die Anzahl der Parameter auf einen begrenzt. Aus einer Serie von numerischen Experimenten zur Ermittlung optimaler Parameterwerte ist es oft schwierig den besten Endlösungsansatz zu wählen. Wie lässt sich die beste Lösung aus hunderten von errechneten Lösungsvarianten ermitteln? Oft wird die Lösungsfindung noch zusätzlich durch sich gegensätzlich beeinflussende Kriterien erschwert. Um den Prozess der Lösungsfindung zu automatisieren wurde in das UM Experiments Modul ein spezielles Tool zur Unterstützung des Lösungsprozesses integriert. Dem Anwender ermöglicht dieses Tool alle Varianten, im Einklang mit den gewählten Kriterien, nach dem Optimierungsgrad zu ordnen. Der Ordnungsalgorithmus basiert auf der Methode des analytischen Hierarchieprozesses nach Thomas Saaty. Diese Methode unterstützt die Verarbeitung von vielen, auch widersprüchlichen Kriterien, eine Zuordnung verschiedener Gewichtungen zu den Kriterien und eine Kontrolle der Richtigkeit der eingegebenen Werte. Um eine Reihe von numerischen Experimenten schneller durchführen kann der Anwender mit Hilfe eines speziellen Erweiterungsmoduls - Distributed Computing-Service genannt - die Rechenlast auf das gesamte Rechnernetzwerk verteilen. Das Erweiterungsmodul verwendet das TCP/IP-Protokoll, daher ist es dem Anwender möglich nicht nur auf das lokale Rechnernetzwerk zuzugreifen sondern auch auf externe Firmennetzwerke. 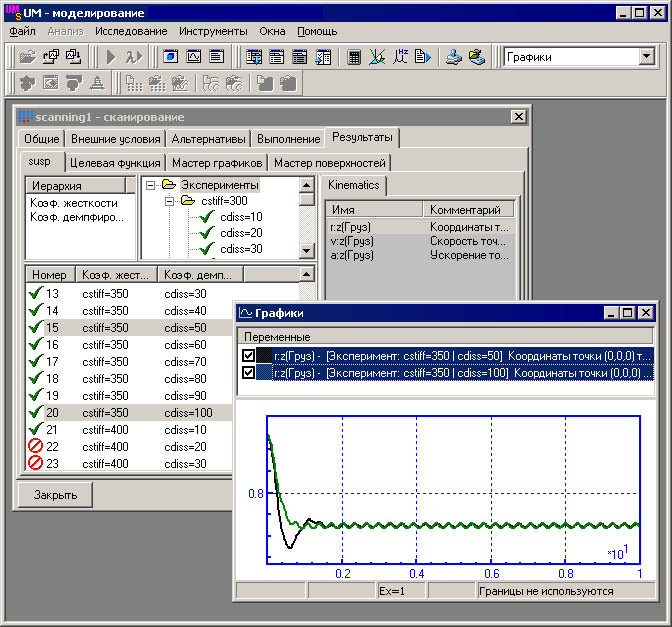 Designer describes parameters to scan (as a rule, it is geometrical, inertia, stiffness and damping parameters), limits and step size for each parameter and starts series of numerical experiments. Scanning saves time history of all selected dynamical performances on a hard disk. These performances are available after the execution of the project. There are special possibilities for scanning dynamical behavior of railway vehicles: with various rail and wheel profiles, various tracks (tangent tracks and curves), various railway track irregularities. Scanning gives us full information about the response surface and the global optimum. It is usually enough to solve an optimization problem. On the other hand, scanning is very time-consuming process so as it is not practically used for problems with dimension more than 4-5. Scanning supports service of distributed calculations that decreases time efforts considerably. This tool is based on a number of classical optimization methods: Hook-Jeevse,s, Nealder-Mead,s, Pawell,s etc. The advantage of this tool is quite low computational efforts. On the other hand the tool has some disadvantages. Firstly, there is always a possibility that the method stops in one of the local optimums and does not find the global one. Secondly, all what the designer has after this kind of optimization does not give the shape of the objective function, it gives just several points on it. So the designer cannot get general overview of the dynamical behavior of the system. However it is well-known that objective functions of real mechanical systems are quite smooth, otherwise it would be high parameter sensitivity of the system that should not take place in real systems. The designer describes parameters and its limits too. Unlike scanning, the numerical experiments are calculated for several key points in parameter space. Values of objective function in other points are calculated with the help of methods based on quadratic approximation. So this tool leads to extremely low calculation efforts especially for multi-dimensional problems and gives response surface. However there are restrictions on using this approach. Response surface should be smooth and should be represented well with the help of quadratic functions. In fact, these restrictions are not so strong for real technical objects because they normally have smooth and nearly quadratic response surface. 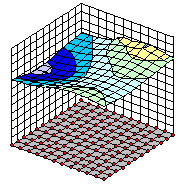 Response surfaces calculated as result of scanning and approximation are shown. Maximal relative error is at most 3 % in that example. Practice of modeling shows that, as a rule, maximal relative errors are less than 10-15 %, but time efforts are decreased in several times. However the optimal solution obtained with the help of this approach can be far enough from the true optimum. Generally, this tool is not intended for searching optimum of objective function. It is rather intended for first, fast and actually not so deep overview of dynamical properties of a mechanical system. The analytic hierarchy process was developed by Saaty. Detailed information is available in . The method is based on principle of hierarchization, where the main, most common goal consists of several more detailed sub-goals, each sub-goal of the first level consists of the corresponding sub-goals of level two and so on. Every sub-goal has only one upper goal. Different sub-goals affect the upper goal with a different weight. 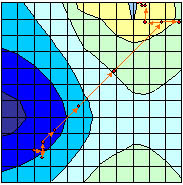 Further, the analytic hierarchy process involves the method to determine the weight with which the various elements in one level influence the elements on the next higher level, so that we may compute the relative weight of the impacts of the elements of the lowest level on the overall objectives. The method can be described as follows. Given one goal, and its sub-goals of the next level lower, compare the sub-goals pairwise in their weight of influence on upper level. Let us arrange the agreed upon numbers reflecting the comparison in a matrix and find the eigenvector with the largest eigenvalue. 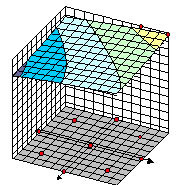 The eigenvector provides the priority ordering, and the eigenvalue is a measure of the consistency of the judgment. To insert the agreed upon numbers the designer has to compare every pair of sub-goals and give an answer for the question "how stronger the influence of sub-goal B on the upper goal than the influence of sub-goal C on it", this number will be included in the (B, C) matrix element. If B and C are equally important then the number is 1, if B is weakly more important than C then the number is 3 and so on up to number 9 when the B is absolutely more important than C.
. Saaty, T. The Analytic Hierarchy Process, McGraw-Hill, 1980. The service is based on TCP/IP protocol. 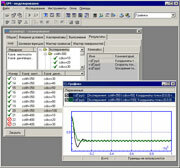 It allows using any computer reachable by TCP/IP under Windows 98/NT/2000/XP for parallel numerical experiments. Service of distributed calculations consists of two parts: server and client ones. The server part works on the head computer and controls the execution, sends jobs and receives results back. The client part is run on the peripheral computers, gets and fulfils jobs and sends results to the server. Service of distributed calculations runs dozens of numerical experiments of the scanning project simultaneously on other computers that are available in your local network, corporate network or Internet. It significantly decreases total time of completion the project. Service of distributed calculations consists of client and server parts. There might be arbitrary number of computer with installed UM client and/or server parts. Remote install and uninstall of the client parts on client computers are supported. Remote installation runs automatically without disturbing remote users. There is a built in tool to determine all computers in your local network that simplify initial procedures of searching and adding the client computer. Server part sends new tasks for remote client computers, controls all stages of running every experiments (including sending the task, running the task and getting simulation results) and the whole scanning project. 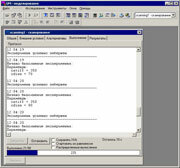 UM server of distributed calculations can turn on and off remote computers. Client part has simple and user-friendly tools that give the user a possibility to control remote using his/her computer as a client computer for UM service of distributed calculations. 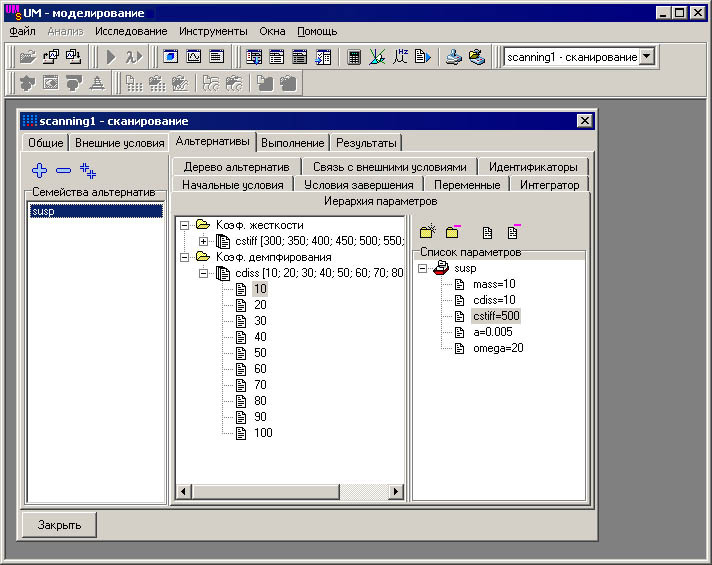 User on the client computer can change the count of CPU cores dedicated for running UM server’s tasks and finally forbid the remote server to use the local computer as a client of UM service of distributed calculations.